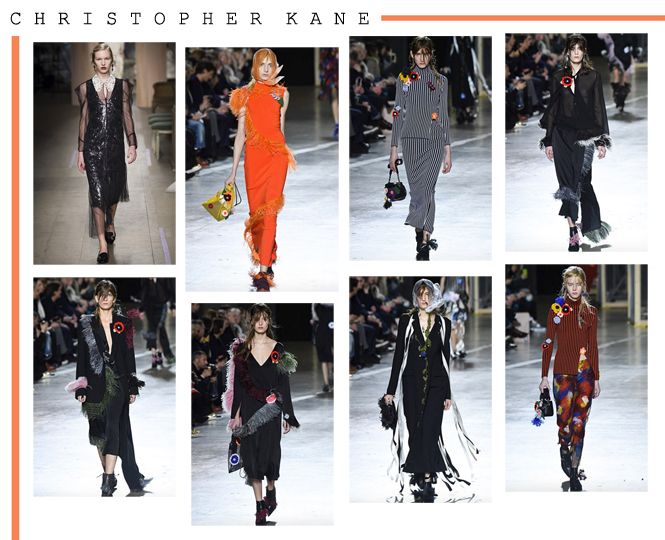 Christopher Kane is undoubtedly one of the most inspiring designers of British origin, never failing to unveil fresh and experimental designs with every collection he creates, his AW16 offering was by no means lacking in such talent. While the collection was visually diverse, my favourite pieces were those adorned with feathers - a similar trait featured at Michael Kors Collection at NYFW - but in this particular manifestation, Christopher Kane accentuated a blank canvas with swatches of muted feathers and the result was innovative, the use of simple floral patches and bright injects of colour alongside this holistically infused vibrance into the collection. With Kane citing the theme of decay as an inspiration for his AW16 creations, such is conveyed through the almost granny-esque head scarves adoring each model and the collective feel of overgrown beauty. The designer himself states that ''dead and thrown away beauty often looks better when it was supposedly alive,'' and this opinion is unapologetically clear through the message that the clothes radiate. There is something about a collection, or a singular ensemble even, that is innovative in the form in which it is comprised - layers upon layers of contrasting material and unusual detail - and you have my unwavering attention. Such is exactly what Toga delivered to a precise measure, delicately coloured sheer fabric met with loose frills and fur and a side of sequin? 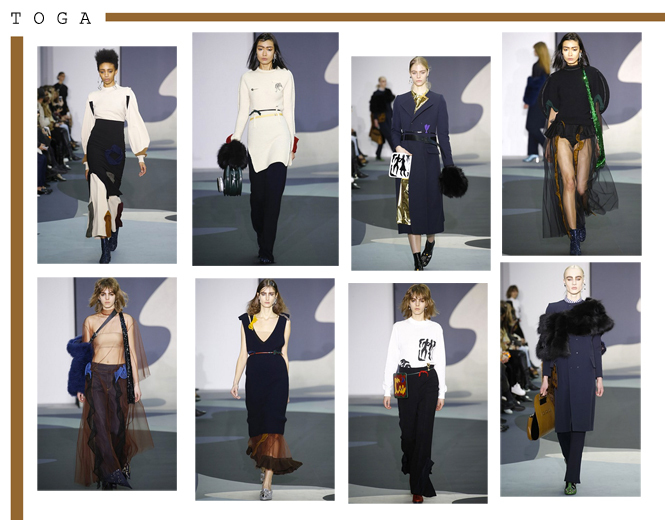 For Autumn/Winter 16, Toga succeeded in executing such a coalition of features in definitive, pin-point manner - no fuss or bulk was found here but instead, efficient yet captivating looks cascaded down the runway in one collectively cool swish of weightlessness. No matter whether it be a well-fitted cream knit, adequately etched with colour of the primary persuasion, or a swash of gold amongst a double-breasted coat of glory - even a dress with frills or belted leather to match, the Toga message was one of effortless style, but not simple, instead a some sort of understated cool with a slight edge yet without ever seeming try-hard. From what I observed through social media, this was a fashion show that generated a triumphant buzz - and rightly so. 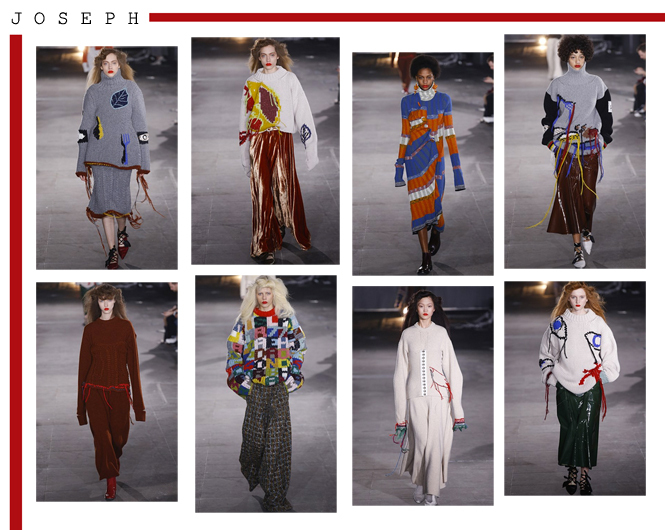 With the collection boasting in many an oversized knit, deconstructed corsets and innovative layering schemes met with chunky texture, in all of its entirety it was the ever so pleasing colourful jumpers which entranced my desires in immediate effect - the mighty roll neck is here to stay so it would seem. A fine pairing was made with knitwear cascading over a full-length skirt - something which is akin to a particular outfit Alexa Chung wore not too long ago - and it was certainly the jumpers etched unusual patterns and drawings left with unfinished ambiance of fringed threads swinging that were the stand-out pieces of the collection, especially when matched with a certain iridescent velvet skirt, oh what a delight. 1205 is a new addition to my sartorial wavelength and gladly so, with the designer Paula Gerbase's innovative nature in terms of fabric sourcing, such makes for an equally fresh and modern collection. The unique use of rarely touched materials translates exquisitely through the clothes, rich tones of mustard, green and deep blue shine in contrast to the delicate shimmer of a sheer ensemble. Shirts of crisp white standing were moulded to create a simple yet striking gathered effect, while slightly elongated sleeves made for a contemporary fit without all the fuss. Holistically, the tailoring was neat, efficient and as modern as it comes but injections of rich tones and fabrics of complexity proved that in this case, the collection speaks for itself without need of any adornment. 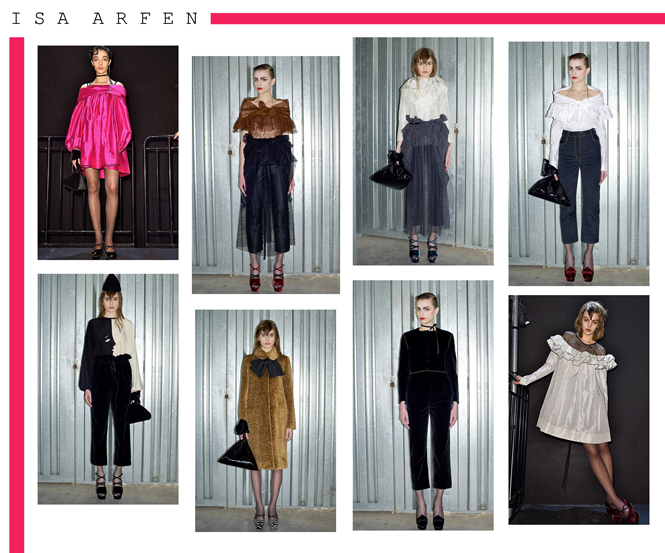 Isa Arfen, a presentation that was indeed a showcase - with nods to the much excessive decade of the 80s - a style that admittedly is not typically among my favourites yet somehow Isa manages to manifest such superfluous ruffles and bold colours in a form which is not outdated, it is vintage inspired yes, but Arfen's AW16 collection is undoubtedly current. Revived necklines, gothic velvet suits and playful bright fuchsia puffy dresses make a bold case for a darker take on the disco infused excess of the 1980s. 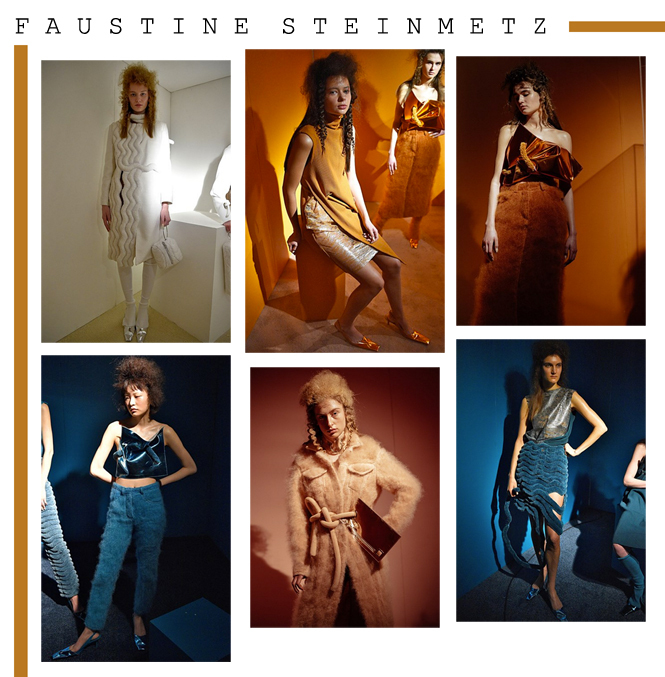 With the designer herself citing “To me fashion is about desire, beauty and fun,” this playful attitude distinctly translates through her creations, and with it brings such joy and shimmer too. 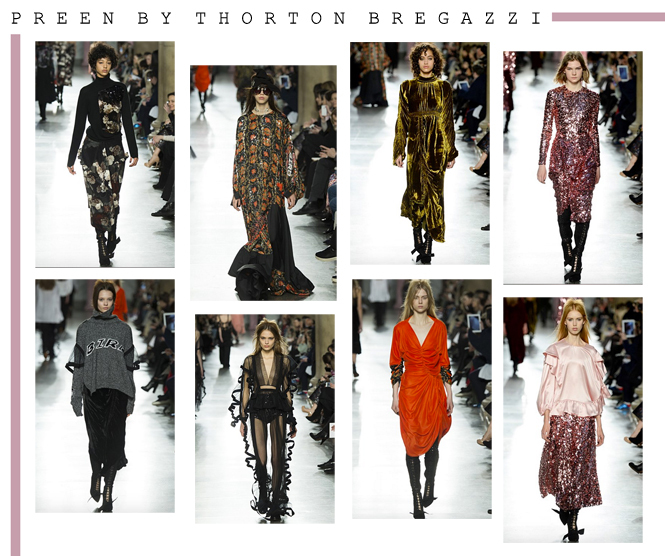 Justin and Thea, the designer partners who make up the dazzling label of Preen by Thornton Bregazzi by no means failed to capture the desires of those in attendance of the Autumn/Winter 16 catwalk show. The collection in a holistic overview ranged from dark, autumnal florals matched with deep tartans and strong, long coats, changing in a fluid sweep to blooming reds, blues, whites - eventually leading to a triumphant and undoubtedly thrilling endeavor of pink shine and sparkle; and that is not to say that such made this collection straight-out pretty, of course with the flushed tones the grunge influence and relaxed tailoring was not forgotten. In a final bow, the collection comes full circle, with loose black ruffles and dangerous but alluring black sheer putting an end to the varied yet collective showcase. The theme of a toughened edge is evident overall and with Thornton stating that the aim was to ''toughen up and modernise the collection'' and doing so by adding ''rock-star vibe,'' such was throughly present, from the lace up boots paired with each outfit and even in the silk and plush of rich rosy hues, frills and all. A reoccurring favourite that never fails to catch my attention season to season is of course, Topshop Unique. 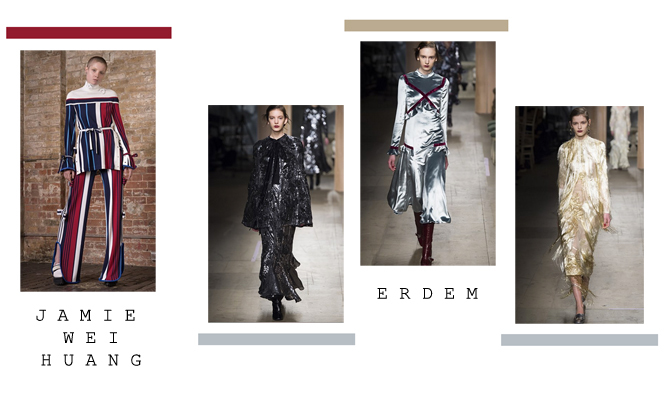 Their AW16 collection is vast in size and with looks ranging from gothic lace and velvet to night-ready sequins and this seasons favourite, the long sleeve. 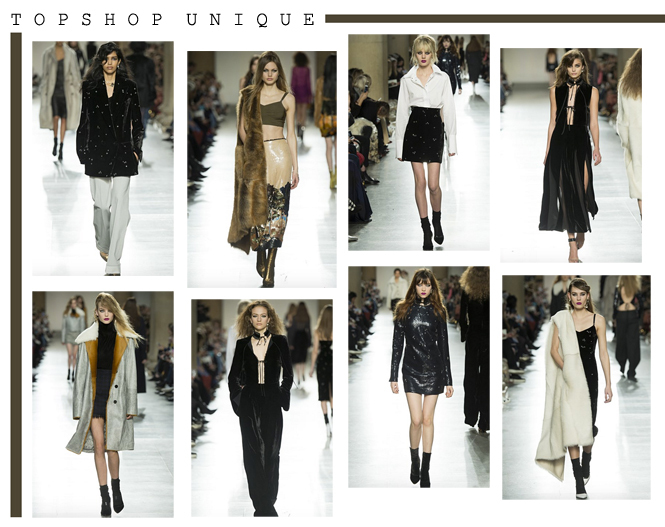 Topshop is a brand which never fails to nail ready-to-wear, and while their efforts may not be as innovative as other independent designers or fashion houses, Topshop Unique's offering is simply on-trend and wearable, they produce pieces that are strong, items that are destined to be coveted straight from the catwalk. 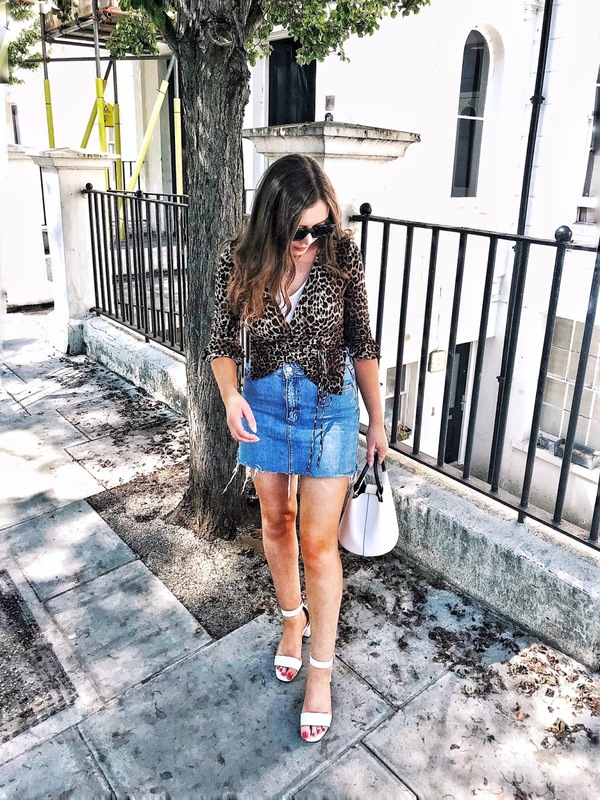 One thing I have found, is that you can always count on Topshop Unique to deliver. 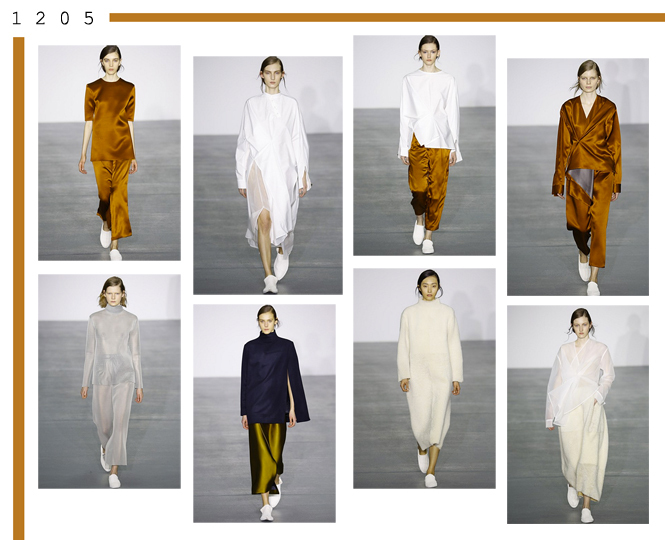 Texture, something which was the prominent feature of this Autumn/Winter 16 collection - that, and tonal dressing. Interesting cuts and innovative rope fittings met with contrasting material of fuzzy finish and sweet-wrapper-shine. This was a collection which oozed a glowing sense of modernity, yet it was one of colourful, carefully matched hue - packaged up (quite literally, the presentation could only be viewed through a key-hole like structure in a boxed construction which housed the models, each decorated to aesthetically match the tone of each outfit) in inventive form and whether that be through a cloud white, a peach dream orange or a standout, yellow with striking effect, the texture and vivid monotone match is one met with harmonious praise. In overview, London Fashion Week AW16 was indeed a season full of innovative collections bursting with inspiration and originality - something which definitely surpassed New York's offering in abundance, and that is not to say that NYFW was without substance, CHECK HERE to see my picks from such however, it goes without saying that for me, LFW has won over my affections. There is no surprise then that after this mammoth roundup of my favourites from the London showcase, I still have some firm favourites that are more than deserving of a mention. Erdem wowed with plush florals - as per typical style, but it was the fluid silk and gold dreamer dress which captivated with its charming tone. 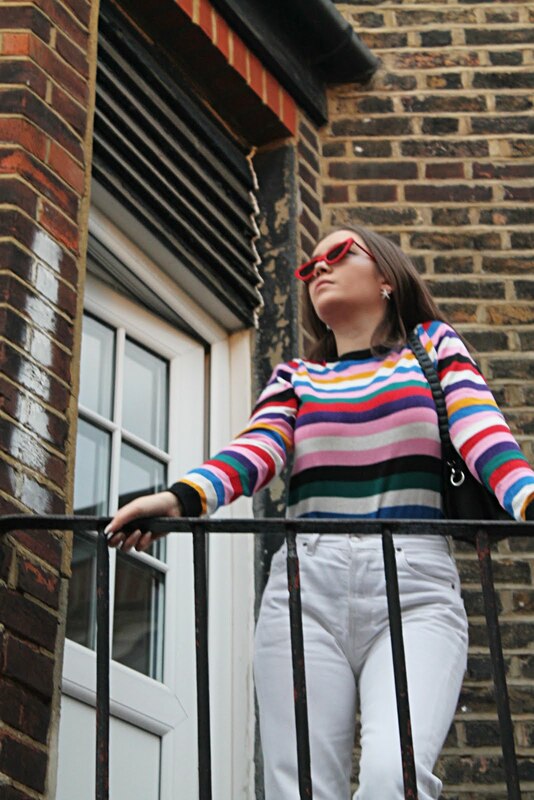 With a collection featuring stripes, a simple yet effective colour scheme and unusual cuts and styling, there was so much to praise at Jamie Wei Huang - my favourite ensemble has to be the striped wide legged trouser and matching belted top (with a roll neck of course) an absolute DREAM of an outfit.